Home / Sharpening Articles / Grits / What grit is a Hard Black Arkansas Stone? I've purchased a Hard Black Arkansas Stone, can you tell me the grit? I've read it could be anywhere from 1200 grit, to as high as 4000 grit. The reason I ask is because on some softer steels I never seem to get the edge I'm expecting. Could it be the steel or my technique? The first thing to understand is that because Arkansas Stones are natural stones (quarried from real Arkansas Novaculite rock), some variation in is to be expected. That being the case, the grit equivalents are usually given as a range, rather than a specific number. Unlike man-made stones, there are some variations in grit that may occur within a natural stone. For that reason, Arkansas stones are graded on hardness, not grit. But because the concept of grit is often easier for people to understand, we provide grit equivalents. The second thing to understand about grit is that there are multiple scales used to express grit numbers that may lead to some confusion. For instance, there is a scale used in the US for abrasives, and on that scale, the Hard Black Arkansas is equivalent to 1200+ girt. There is another scale used for Japanese water stones (even some not made in Japan), and on that scale, the Hard Black Arkansas stones are equivalent to approximately 4000 grit. The main thing to understand is that no matter what scale is used, the Hard Black Arkansas Stone is a very fine stone. We consider the Hard Black Arkansas to be approximately 4000 grit equivalent using the same rating scale as water stones. 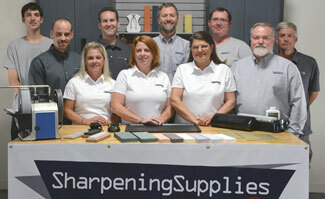 If you are not getting the edge you're looking for when sharpening with the Hard Black Arkansas stone, there are a few possibilities to consider. It may be your sharpening technique that is causing you issues. Maintaining a consistent angle while sharpening is difficult and the biggest hurdle most sharpeners face. With practice or with the assistance of a knife sharpening guide, this can be solved. The other common technique issue is failing to establish a proper edge on the blade before using the Hard Black Arkansas stone. If your knife edge is not prepared properly before using a very fine stone like a Black Arkansas, you will not get the results you are looking for. You should first use a coarser stone to establish your edge before moving to a very fine stone. It may also be the steel that your knife is made from that is causing you sharpening issues. Some steel blades just don’t take a good edge. Often these are lower quality/softer steel knives. You can check if this is the case by sharpening a few different knives and comparing the results. If you can get good results with other knives, your particular knife may just not take a good edge. The Hard Black Arkansas Stone is an extremely fine stone that can be expected to put near mirror polish on an edge. With proper sharpening techniques and a properly prepared edge (generally using a coarser stone to prepare the edge), the Hard Black Arkansas Stone should give your blade an extremely sharp edge.